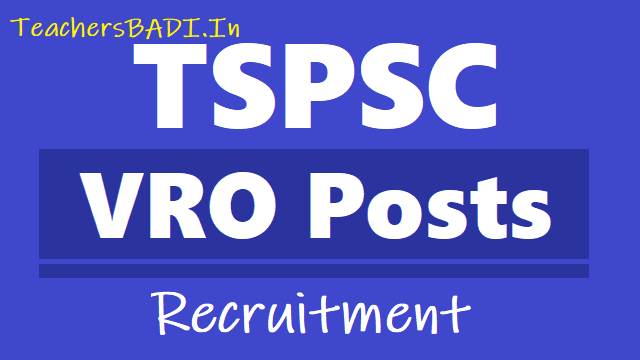 TSPSC VRO Results 2019, VRO Selection list Results @ tspsc.gov.in: Merit list Results, Ranking list results @ tspsc.gov.in /TSPSC VRO posts 2018 Hall tickets, Exam date: 16-09-2018: TSPSC VRO posts 2018 Recruitment, Apply Online upto July 8, TSPSC VROs Recruitment 2018: TSPSC has given VRO posts 2018 recruitment notification and Applications are invited Online from qualified candidates through the proforma Application to be made available on Commission’s WEBSITE (www.tspsc.gov.in) to the post of Village Revenue Officer in Revenue Department in the state of Telangana, TSPSC VROs Online application form, How to apply for TSPSC VROs Recruitment, Last date to apply for VROs, Application fee, Eligibility Criteria, VROs Hall tickets download date, VROs Results date and more details are time to time available at tspsc website. Telangana State Public Service Commission, TSPSC has announced the merit list for Village Revenue Officer, VRO post. Candidates who have appeared in the recruitment exam can check the merit list available on the official site of TSPSC at tspsc.gov.in. The merit list contains ranking of all the candidates who appeared in the VRO exam. The examination was conducted on September 16, 2018, in the state. Through this recruitment process, 700 Village Revenue Officers will be appointed in the state. The official notification was notified in June 2018 and the online application process ended on July 2018. the selection of the candidates will be made by the marks secured in the objective type examination conducted in September 2018 either online or OMR based. For more information, candidates can check the TSPSC. TSPSC VRO Result 2018 - Village Revenue Officer Merit List Released: TSPSC has released the VRO results on the official website. The merit list based on the TSPSC VRO result has been published on the website, tspsc.gov.in. The TSPSC, Telangana State Public Service Commission conducted the written examination for recruitment to the post of Village Revenue Officer (VRO) in Revenue Department on September 16, 2018 in two sessions. The merit list of this examination has been prepared and is made available in the Commission's Website, tspsc.gov.in. 7,38,885 candidates have appeared for the TSPSC VRO examinations in September. The Commission had released the official answer keys of this examination in October this year. According results notification, "The candidates if any are admitted in the Merit Lists as per the Court Orders, their admission is purely provisional and subject to outcome of the final judgments in the respective W.Ps/W.As pending before the High Court." TSPSC VRO Results : How to Check? Telangana State Public Service Commission (TSPSC) has released the results of the general recruitment examination held for selection of Village Revenue Officer (VRO) in Revenue Department. The result is now available on the official website of the TSPSC - tspsc.gov.in. The candidates can visit the official website of the Commission to check their result. A total of 7,38,885 candidates have been admitted in merit list for the post of Village Revenue Officer in Revenue Department. Step 2: On the home page, click on the activated link for VRO Merit List Results. Step 7: Download results and take a print and preserve it for future reference. TSPSC Answer Key: TSPSC has conducted written Examination for recruitment to the post of Village Revenue Officer in Revenue Department notified vide Commission’s Notfn No.13/2018 on 16/09/2018. The Final Keys of this exam will be available on TSPSC website from 17/10/2018. For further details please visit www.tspsc.gov.in. No further objections will be entertained on Final keys. Telangana VRO Final Answer Key 2018 released, result expected soon on Website: Telangana State Public Service Commission (TSPSC) has released the final answers keys for village revenue officer in revenue department (general recruitment examination). The final answer key was released on the official website of the TSPSC. The candidates can visit the official website of the Commission to check the answer key. The TSPSC had conducted the Village Revenue Officer exam on September 16 and the OMR sheet for the same was released on September 21, 2018. There are 700 vacancies to be filled in the VRO department of the state government. Notification in this regard was released in June and the application process was conducted from June 8 to July 2, 2018. The results of the VRO exam is expected to be released soon on the official website. Step 2: On the home page, click on the section for Results, Keys and OMR sheet. Step 3: On the window that opens, click on Answer Key link to check. OMR Sheets: Telangana State Public Service Commission, TSPSC has released the TS VRO OMR Answer Sheets. Candidates who have appeared for the TS Village Revenue Officer Examination can now download their OMR sheets and check the Answer keys on the online portal tspsc.gov.in. Steps and direct link to check TS VRO Answer Keys 2018 are also provided below. Candidates to please note that the link to download the OMR Answer Sheet is now available on the official website tspsc.gov.in. However, the notification for the Answer Keys has not been released yet. Usually, TSPSC also provided the answer keys along with the OMR sheets. Candidates are advised to login and confirm the same. In case the answer keys are not released yet, they would be released soon. The TSPSC has conducted Written Examination for the post of Village Revenue Officer in Revenue Department notified vide Commission’s Notfn No.13/2018 on 16/09/2018 FN. 7,87,049 candidates attended the exam. The digital copies of OMR sheets of all these candidates are displayed on Commission’s website within 5 days of completion of exam i.e on 20/09/2018. The candidates are advised to download the digital copies of their marked OMR answer sheets. If any difficulty is faced in downloading the OMRs or if any discrepancy like incomplete images is found due to folding of the OMRs while scanning, the candidates can approach the Commission immediately. The Commission will take necessary action immediately and replace the erroneous copies with correct copies. The list of Invalidated OMRs with Hall Ticket numbers will be published on the website shortly. Step 2: On the home page, click on the activated link for VRO OMR sheet. Step 4: Enter your TSPSC ID, Hall ticket number and date of birth and login. 1. పరీక్ష ఉదయం 11.00 నుంచి మధ్యాహ్నం 1.30 వరకు నిర్వహిస్తున్నారు. అభ్యర్థులు ఉదయం 10.45 గంటలకు పరీక్ష కేంద్రాలకు చేరుకోవాలి. ఉదయం 9.30 గంటల నుంచే సెంటర్ లోకి అనుమతిస్తారు. 2. అభ్యర్థులు పరీక్ష కేంద్రాలకు తప్పనిసరిగా ఏదైనా గుర్తింపు కార్డుతోపాటు హాల్ టికెట్ను తీసుకెళ్లాలి. 3. హాల్ టికెట్ రాని అభ్యర్డులు ఫొటో గుర్తింపుకార్డు (ఉదాహరణకు: పాస్ పోర్టు, పాన్ కార్డు, ఓటర్ కార్డు, ఆధార్, డైవింగ్ లైసెన్స్, ప్రభుత్వ ఉద్యోగి ఐడీ కార్డు)తోపాటు రెండు పాసపోర్టు సైజ్ ఫొటోలను తీసుకెళ్లి పరీక్ష కేంద్రంలోని చీఫ్ సూపరింటెండెంట్లను కలువాల్సి ఉంటుంది. 4. ఓఎమ్మార్ ఆన్సర్ షీట్లో బబుల్ చేయడానికి బ్లూ లేదా బ్లాక్ బాలీపాయింట్ పెన్ను వాడాలి. అభ్యర్థులు ప్రత్యేక అటెండెన్స్ రిజిస్టర్లో సంతకం చేయాలి. 5. వైట్నర్, బ్లేడ్, ఎరైజర్ ఉపయోగించడం నిషేధం. 6. మొబైల్ ఫోన్లు, క్యాలిక్లేటర్లు, ఇతర ఎలక్ట్రానిక్ పరికరాలను పరీక్ష కేంద్రాల్లోకి అనుమతించరు. 7. షూలు, ఆభరణాలు, చైన్లు, స్టడ్స్, చేతి వాచ్లు తెచ్చుకోవడం నిషేధం. 8. పరీక్ష సమయం పూర్తయ్యే వరకు పరీక్ష కేంద్రం నుంచి బయటకు వెళ్లడానికి అనుమతించరు. పూర్తి వివరాల కోసం టీఎసపీఎస్సీ వెబ్ సైట్ను సంప్ర దించాలి. TSPSC VRO Hall Ticket Download, TSPSC ID – How to check .. Go to tspsc.gov.in website and click on know your TSPSC ID. Direct link to check your TSPSC ID is also provided here. A new window would open. Enter your Aadhaar Number and Date of Birth to retrieve your TSPSC ID. Candidates, who have the TSPSC ID, can skip this step. To get your TSPSC VRO Hall Ticket 2018. A new window would open. Enter your TSPSC ID and Date of Birth to login. On the page, click on Download Hall Ticket to get your hall ticket. Candidates are advised to download and print the admit card. The TSPSC VRO Exam 2018 is scheduled for September 16, 2018. A total of 700 seats of VRO would be filled by means of the VRO 2018 Recruitment. The candidates who have applied for the post of Village Revenue Officer Vide Notification No.13/2018 Dt: 02/06/2018.They are directed to download the Hall Tickets from Commission’s Official Website www.tspsc.gov.in made available on the website. The Hall Ticket may be preserved carefully by the candidates for future requirements at the time of Certificate Verification etc. In case of any difficulty in downloading the Hall Tickets the candidates may contact the Officials of the Commission’s on the phone numbers given below. 1. Intermediate Public Examination conducted by the State Board of Intermediate Examination or its equivalent examination. TSPSC VRO posts 2018 Hall Tickets can be downloaded 07 days before commencement of Examination.